Acne is a problem that a lot of people have to deal with. I used to be acne prone and took a few years to fight with them. I have to say it is so so so annoying. Let’s see the statistics,60 million Americans have active acne, OMG, what a huge number! In Korea, there are hundreds of skin care products designed for acne treatment including face masks. Hence, today I will recommend the best Korean face masks for acne based on my own and my friends’ experiences. In my opinion, deep cleansing or thorough cleansing is one of the most important things you can do to get rid of acne. The deep cleansing mask is the convenient way to achieve this purpose. Even though Korean skin care is famous for its sheet masks, for the deep cleansing mask I recommend using the clay mask. Below are my favorites. An oldie but a goodie! I have been using this one for years. Even though I don’t have acne anymore, I always use it as a weekly deep cleansing mask. 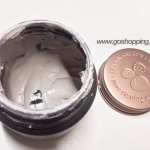 Made from Volcanic pore clay and have really good effects on absorbing sebum and remove dead cells. Both of them are the main causes of pimples. It makes my skin feels like breathing fresh air.Suit for combination and oily skinned peers. Read my detailed review here. This one is quite popular in both Korea and US. It’s infused with mud and water alongside kinds of plant extracts such as green tea, aloe vera leaf, and oregano leaf extract. I like the cute pig on the packaging as well as the interesting feeling when the bubble comes up on the face. It is truly funny when you apply it. It will make your face fresh and soft. Besides, this carbonated bubble mask is so gentle that suit for all skin types including sensitive skin. I like clay mask so much because it just likes the vacuum cleaner to drag all dirt things from my face. It is important to do some anti-inflammation works after unclogging your pores from dead skin cells. There are 3 Korean anti-acne masks I think do their job well. I always take this Dr.Jart sheet mask as rescue mask. You know, I still may have some breakouts during menstruation. After applying it and having a good sleep, I feel my pimples reduced significantly the next morning. 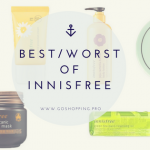 It includes tea tree oil and salicylic which are well-known acne-fighting ingredients.In addition, it is free of parabens, sulfates, and phthalates. Besides, I really enjoy the feeling of this microfiber mask, it is so soft and tight fitting. Except for anti-acne effect, this clearing solution mask can also be used for soothing redness. I think it is good for all skin types. 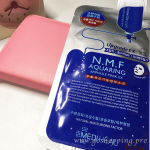 I wrote a review about mediheal nmf ampoule mask before, it is a really good hydrating sheet mask. I love it! That’s why I was looking forward to trying this mediheal tea tree mask. The formula here contains Centella Asiatica Extract, Hamamelis Virginiana (Witch Hazel) Water and Tea tree leaf oils which help to control sebum secretion and anti-inflammation. It also includes Butylene Glycol, Propylene Glycol, and Glycerin to retain your moisture level. Some anti-acne products will make your skin feel stripped but this one will not. However, it is not alcohol-free. The material of this mask is soft and fitted well. Besides, it makes me feel refreshing and relaxing. My sister got some break-outs last summer and I gave this to her. She applied this mask 3 times a week and her pimples disappeared after 2 weeks. For me, it is also one of my rescue face masks in the kit especially when summer comes. This aloe vera gel will not work wonders for your acne-prone skin, however, it is natural, safe and multi-purpose. As we know, aloe vera has a good anti-inflammation effect. This famous Natural Republic product (Bestseller in Korean) contains as high as 92% percent aloe vera alongside Glycerin and Dipropylene Glycol. Notice that it is not alcohol-free. When your acne gets controlled, the next task would be pigmentation removal. Therefore the mask with brightening effect would be your choice. Vitamin C is one of the best known, safe and most effective non-prescription skin brighteners.It works for all kinds of pigmentation including acne scars. Hence, I always try to find some good products with Vitamin C in it. The formula of this mask includes Vitamin C,γ-oryzanol, and Tocopheryl Acetate to ensure the lightening effect. This mask will accelerate the speed of acne scar fading and brighten your skin. In addition, it is a good hydrating mask as well even though you are not acne-prone skinned. Apply it twice or 3 times a week after toner. As it is full of the essence so you need to pat the extract into your face or rinse it off. The ingredients in this mask include Bee Venom, Snail secretion, Arbutin, and Adenosine. Hence it is said to have the good effect on skin whitening and pigmentation removal. 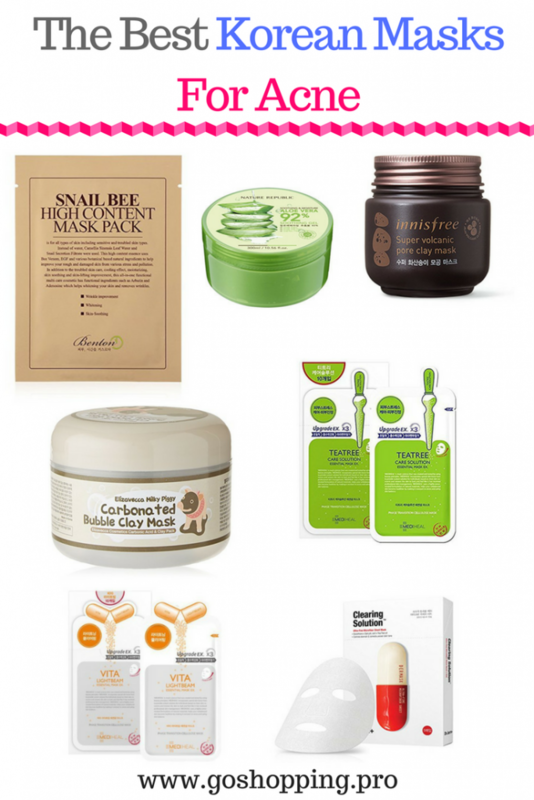 This snail bee mask fits well and plumps up my skin quickly.More importantly, I found it does help to lighten the skin after I finished my first pack. For pigmentation removal purpose, I have to say it is a long way to go. Therefore you should be patient. 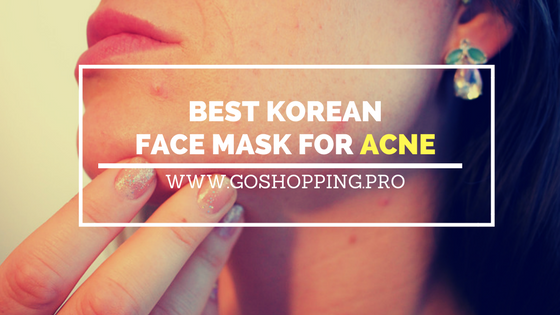 All in all, these are my recommendation for the best Korean face masks for acne. Hope it helps you out! Besides, If you are suffering from back acne as well, you may want to know what causes acne on back. 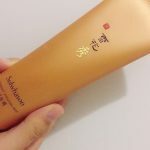 Sulwhasoo Overnight Vitalizing Treatment Review-Is it a good overnight mask?